I baked these lemon macarons on the same day I baked the chocolate ones. I used up all my lemon zest on the previous batch (which failed) so this batch doesn’t have any zest in it. I actually wanted to add some vanilla extract to make vanilla macarons… but I forgot… oops! 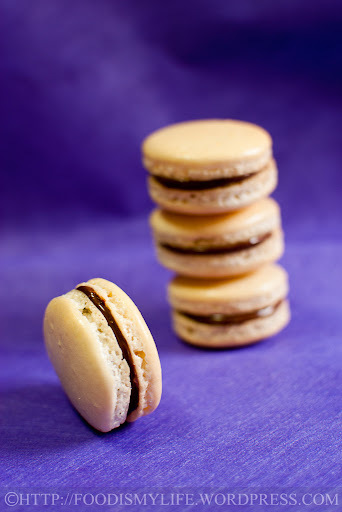 Macarons are really very, very finicky things – the chocolate macarons are perfectly alright, with a really good shell. The lemon ones, which are made using the same recipe as the chocolate ones (minus the cocoa), are hollow inside, resulting in weak and thin shells which got pierced through very easily. Also, the surface of the shells became sticky after I took them out from the fridge, unlike the chocolate ones. I think all these is probably due to the over-beaten egg whites… I’ll definitely need to practice several more times to get it right! In terms of flavour, my friends actually prefer these to the chocolate ones – I guess the tang of the lemon curd gives a sharp contrast to the sweetness of the macarons, creating a unique taste. I just read Alan’s (travelling foodies) post a few days back on his reconstruction of one of Pierre Hermé’s new macaron flavours for 2012 – and I’m totally blown away! I love the lime + white chocolate ganache combination and am already thinking of making some macarons to pair with it. Ran out of lemon curd… so I sandwiched the remaining with Nutella… pretty darn good! I’m submitting this post to Aspiring Bakers #17 – March Macaron Madness! (Mar 2012) hosted by Alan of Travellingfoodies. 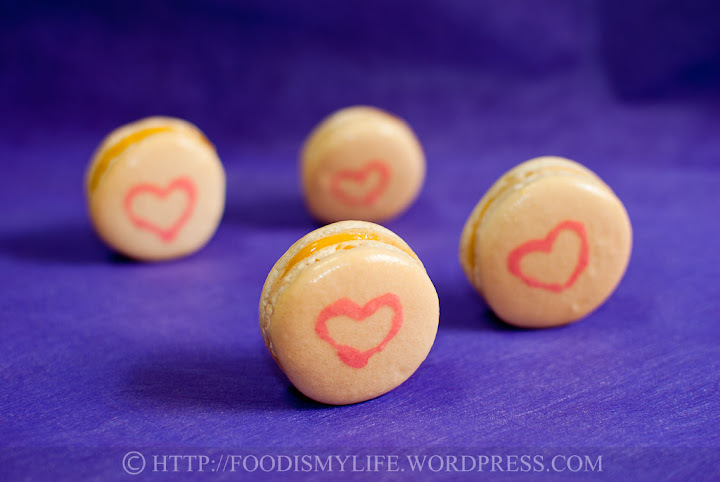 Do hop over there on 1 Apr 2012 to check out all the lovely macarons baked by other bloggers! Stir together the zest, lemon juice and sugar in a small pot. Bring to a simmer over low heat. Place the egg yolks in a clean bowl. Whisk it gently with a wire whisk. Temper the egg yolks and return the egg yolks mixture to the pot. Cook over medium-low heat until the liquid has thickened, which will take about 5 minutes. Remove from heat and let it cool completely, stirring frequently. Transfer the lemon curd to a bowl or a container. Cover the top directly with clingfilm (press the clingfilm down so that it touches the surface of the curd) and refrigerated until needed. Sift the almond flour and icing sugar in a large bowl. Alternatively, place them in a food processor and blitz for several seconds to break up any lumps. It is essential to remove the lumps so that there will not be any bumps on top of the macarons. In a clean, dry, oil-free bowl, add in the egg whites. Using an electric mixer, turn the speed to low and whisk the egg whites for 10 seconds. Increase the speed up to high and whisk for another 30 seconds, until the egg whites and foamy and white in colour. Add in the caster sugar - 1 tablespoon at a time - and whisk for 30 seconds (on high speed) before adding the next tablespoon. Continue whisking on high speed until the meringue is white, shiny and forms stiff peaks. To check for stiff peaks, turn off the electric mixer and lift it up and turn it upside down. If the meringue remains vertical and did not droop down, the meringue is ready. If not, continue whisking and check frequently - you don't want to overwhisk the egg whites. Once the meringue is ready, add in the sifted almond flour, icing sugar and lemon zest all at once. Add in a little food colouring. Using a large rubber spatula, fold in the dry ingredients until no streaks of dry ingredients remained. Scrape the sides frequently to incorporate all the dry ingredients. The batter should be shiny, sticky, thick but liquid (this is what they like to call "lava" like batter): scoop up some batter and drop some it on to itself, the dropped batter should slowly sink and merge back with the remaining batter in more than 5 seconds but less than 20-30 seconds. If it sinks and merge back within 5 seconds, it is likely that you have over-mixed the batter. If it doesn't sink back, fold a few more times, and test again. It is a tricky balance - you can't under-fold and you can't over-fold either. Line several baking sheets with baking parchment. Transfer the batter into a large piping bag with a plain tip. The batter should flow out easily. Pipe small rounds of batter (about 1-inch in diameter) onto the baking sheets, leaving a 1.5-inch spacing in between. After piping, bang the sheets on the table counter to release air bubbles and to flatten the shells. Use a tooth-pick to poke the air bubbles (especially the big ones) and a small spatula to smooth out the tops. This step is optional but it does help to give you prettier macarons. Optional: to make the heart shape on the macarons, reserve 1 tablespoon of macaron batter and colour it with red food colouring. Pipe 5 macarons and use a toothpick to draw the heart with the red macaron batter. Alternatively, spoon the red macaron batter in a small piping bag and pipe a small heart. Bang the sheets on the table counter to release the air bubbles. Proceed with the steps below. Don't pipe too many macarons at one time as they will dry out, making it hard to draw the heart. Let the macarons rest for 45 minutes (the weather in Singapore is humid, hence I let them rest longer, if the weather is dry, you'll only need to rest them for about 20 to 30 minutes). Touch them gently (top and the sides) - they should not be tacky / sticky and they will not look shiny anymore. Bake the macarons, one sheet at a time, for 10 minutes, then rotate the sheets 180 degrees and bake for another 8 minutes until the top is crisp and the feet do not wobble - touch the top gently and if you see the feet shaking, they are not ready yet - bake and check every 1 minute. Place the baking sheet on a wire rack. Let the macarons cool for 5 minutes. Slide the parchment paper of macrons onto a damp tea towel. The thermal shock (hot from the macarons and cold from the damp tea towel) will help to release the macarons from the baking parchment. Remove the macarons from the baking parchment and cool completely on a wire rack. Pair the macarons so that the same size ones are matched together. 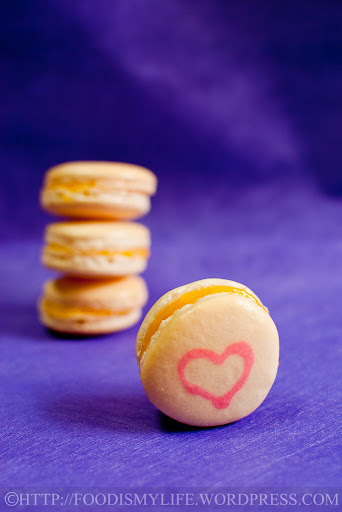 Place a small teaspoon of lemon curd (a little goes a long way) in the middle of a macaron. Sandwich with the other macaron - gently twisting and pressing it down until the lemon curd extends to the edge of the macaron. Do not eat the macarons immediately! Place the macarons in a container and refrigerate them for 24 hours to help the flavours meld together - the lemon curd will help soften the macaron to achieve the crispy exterior, chewy interior texture. Take them out of the fridge 15 minutes before serving so that they will be at room temperature. Consume them within 3 days. Tempering the egg yolks – place the bowl of egg yolks on a damp cloth to prevent the bowl from sliding around on the table counter. Pour the heated liquid mixture into the egg yolks slowly and in a steady stream, whisking constantly so that the yolks do not scramble. When you’ve added half of the liquid mixture, the temperature of the eggs should be warm enough to be poured back into the pot for further cooking. Almond flour = almond meal = almond powder = normal almond grind into powder. A fine almond flour will give you a smooth macaron top. Icing sugar = powdered sugar. It is essentially a mixture of finely ground sugar and corn starch. Buy a good quality brand of icing sugar – it will have a higher sugar and lower corn starch content than those cheaper brands. Apparently corn starch is essential in a macaron recipe, so don’t try to make your own icing sugar, just get a good quality brand will do (I like to use the SIS brand). Egg whites – Aging the egg whites reduces the moisture content, which makes it easier to get a good meringue. Cold eggs separate more easily – crack the eggs and place the egg whites in a container. Make sure their is no trace of yolk or water in the container. Cover and refrigerate them for at least a day, up to a week. Let the egg whites rest at your table counter for at least 30 minutes until it has returned to room temperature before using. Cold egg whites will not whip well – making it harder to get a stiff meringue. I used fresh egg whites, so I aged them by microwaving them 20 seconds on medium. To freeze the egg yolks, place the egg yolks in an ice-tray (one egg yolk per compartment) and add in 1/4 teaspoon of sugar to each yolk. Stir with a small spoon until the sugar has been incorporated and freeze the yolks. Unmould and wrap them with plastic wrap. Store in a ziploc bag in the freezer. Try to use powder or gel food colouing. Liquid food colouring tendes to introuduce too much liquid in the batter. Meringue is very sensitive to fats, and liquid. The bowl needs to be clean, dry and oil-free. Apparently stainless steel bowl works best but I used my plastic mixing bowls and the results were not too bad. This video shows you what it means to whisk egg whites into stiff peaks. The videos mentioned in the chocolate macarons post are good references too. The figure-of-eight method of folding will not work here. I used a cut, fold and turn method. It’s essential to know the consistency of the final meringue – so you’ll know how much to fold. Check out the videos mentioned in the chocolate macarons post. Use only baking parchment / baking paper to line the baking sheets. You can use a silicon mat if you have one (some say it’ll stick, I’m not sure since I don’t have one). Do not use aluminium foil or try to butter the sheets. If you are having problem with the baking parchment not staying in place, place a small drop of meringue batter on all four corners of the baking parchment and press it down on to the baking sheets. This will keep the baking parchment from moving about. The meringue batter will be liquid and flowy, To prevent the batter from flowing out while you’re filling it, twist the bottom of the piping bag and place the piping bag into a tall glass before filling it. Some suggest piping the macarons at a 90 degrees angle – I find that a bit hard because the batter is quite liquid, so I like to pipe them at a 45 degrees angle with the piping tip very close to the baking parchment. Then I press gently and count to three then lifting it up in a flicking motion. Practice makes perfect! The macarons will spread a little while resting, so it’s essential to leave some space in between. I learned this the hard way – under-baked macarons will stick terribly onto the baking parchment and the macarons will sink into their feet. Macarons can be stored in an air tight container for 2-3 days before filling them. Once filled, they need to be stored in a refrigerator. Lemon curd is softer and more liquid than chocolate ganache, hence it will seep through into the macarons at a faster rate, so try to consume the lemon macarons as soon as possible. how to store my macrons? Hi Carol, I’m staying in Singapore, so I store my macarons in an air-tight container in the fridge. Thank you! I didn’t get perfect results on the first try too, it took me about 4 tries before I get my first successful batch of macarons. Do give it a shot, it’s a great dessert that enabled me to learn a lot from! I LOVE macarons but I am not sure I’m good enough baker to make them myself. You did a wonderful job, these look and sound delicious! Thanks for the information about the lemon curd filling. We always liked the texture of matured macarons with the buttercream filling, but always wondered what lemon curd would do to the shells, but haven’t have a place that gave that info until coming here. So thanks muchly for providing the exact info we were looking for! Also, about the icing sugar and cornstarch, it isn’t essential to have the icing sugar contain cornstarch to turn out perfect macarons. We’ve always used icing sugar without cornstarch. Thank you! I like how the sour from the curd contrasts the sweetness of the macarons. I hope they will love you back soon! Thank you Bobbi, I managed to find the backdrop after much digging in the storeroom… haha. Take care! Thank you Samantha! Why not have both? 😉 Can’t wait to make layered cakes for the next Aspiring Bakers! You have so much patience to make these cookies. Love the purple backdrop- really makes your cookies beautiful. Hi Jasline! I love macarons and your Lemon Macarons look so good! I’m not a baker s it is my dream to make macarons one day. I like the lemon curd filling. The heart shape is cute too! I really like how you described and explain in details. Great for a beginner like me. Would love to try and make them! I love me some macarons…..haven’t attempted to make them yet, but one day! Thank you! 🙂 Thanks for stopping by! Thank you! Yes I think it’ll be a great Valentine’s day present! I’ve been so nervous about making macarons. Thanks for all the helpful tips! Those are absolutely adorable! Beautiful! oh how adorable! Especially for Valentine’s day!!! Thank you for the compliments! I’m happy they turned out pretty! This looks so complicated and tricky, I’m impressed that you made these! Beautiful!! They look really fun and I love lemon. I wonder if the lemon zest affected your shells? The zest does have moisture in it….It’s fun to keep practicing because you get to eat the results over and over! I love the hearts too, very pretty! I have never made macarons before and applaud you for making these gorgeous cookies. I love the idea of March Macaron Madness, will hop over and take a look. I think they look beautiful!